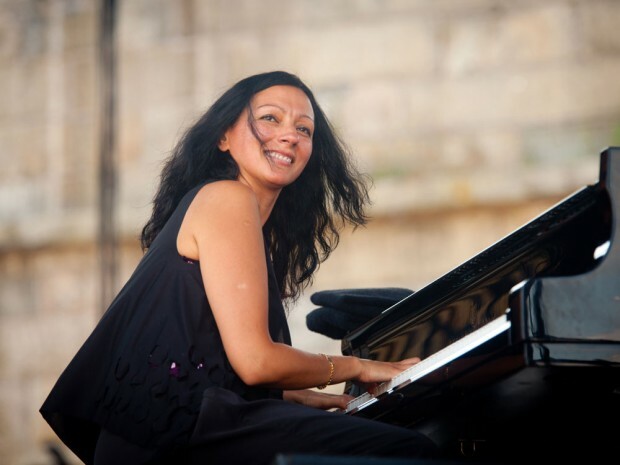 Composer and pianist Amina Figarova performs eight dates with her New York sextet August 9 – August 21, 2013 in support of her recent album Twelve. The band will perform in NYC; Marblehead, MA; Delaware Water Gap, PA; Washington, DC; Tulsa, OK; Fayetteville, AR; Idyllwild, CA and Oakland, CA. Her 12th album — and debut release on the renowned independent German label In + Out — the CD celebrates jazz as an international music and especially New York City as a vibrant locale where jazz gypsies may feel most at home. A suite of songs for sextet Figarova wrote swiftly in 2011 after moving with her husband and musical partner, flutist Bart Platteau, to Forest Hills, Queens from their longtime European base, Twelve is suffused with the heightened expectations, sense of adventure and fresh perceptions that artists gain from being in the right place at the right time. Figarova was born and raised in Baku, Azerbaijan, Platteau is from Belgium, and together they are citizens of the world. They've toured extensively, developing a tight-knit ensemble that, despite inevitable personnel changes, has attained a distinctive and inimitable voice by concentrating on all-original repertoire for almost 18 years. During that period, Figarova has collaborated with musicians residing in both the U.S. and Europe and has built up a circuit of welcoming venues; the Amina Figarova Sextet has triumphed at the main stage of the Newport Jazz Festival, been invited repeatedly to New Orleans Jazz and Heritage Festival, and won critical and audience acclaim in Chicago, Detroit, Paris, Amsterdam — and of course New York. Figarova’s compositions strike a perfect tone, employing genuinely beautiful harmonizations that capture those fleeting thoughts when the puzzling jostle of daily existence comes into unexpected but deeply satisfying sync. The Amina Figarova Sextet features pianist Figarova with Bart Platteau on flutes, Alex Pope Norris on trumpet, Wayne Escoffery on tenor sax, Jeroen Vierdag on bass and Jason Brown on drums. Friday August 9: 7 p.m. - 11 p.m.
Saturday August 10: 8 p.m. The Unitarian-Universalist Church, 28 Mugford St.
Sunday August 11, Sets at 8 p.m. – 10 p.m.
Monday August 12, Sets at 8 p.m. – 10 p.m.
Thursday August 15, 7 p.m.
Friday August 16, 8 p.m.
Sunday August 18, 3 p.m.
Monday August 19, 8 p.m.